Hilborough church, like its near neighbour Great Cressingham, is big, impressive, architecturally important, and apparently little-known. The two churches have more specific similarities: the way a magnificent tower has been built against an aisled and clerestoreyed nave, but retaining the chancel of almost two hundred years earlier, and the symbolism in the flushwork, with the crowned M of the Blessed Virgin Mary and the crowned sword of St Michael alternating in the base course at both churches. The reason that both are less-well known than they should be is also the same, I am afraid. 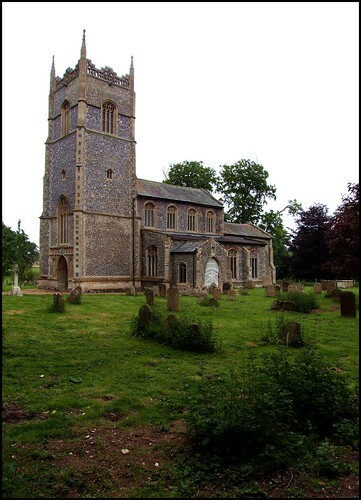 Unlike its neighbour, All Saints is not far from very busy traffic on the Thetford to Swaffham road. However, unless you knew it was there, you would not think to look for it, for it is set in the grounds of Hilborough Hall, not a quarter of a mile from the road, but invisible from it. There is no signpost to it, either: you travel down a track which leaves the main road almost opposite the lane to Foulden, and eventually the splendid tower emerges out of the trees. The track sets you down gently in a meadow to the south of the church, but it is clear that this building was intended to be seen from the west, because the frontage of the tower is spectacular. In the spandrels of the door, a wild man holds a severed head, while a merchant of the 15th century looks across at him. In between are the arms of the Lords of the Manor flanked by shields which were probably painted at one time. The graveyard is a peaceful spot, the trees absorbing the sound of the traffic. But when you go up to the south door, you will probably find it locked, and there is no keyholder notice. I was all prepared to be fairly grumpy about Hilborough church, but I think the lack of easy access is probably more a consequence of the church's secrecy and quietness than any deliberate attempt to be unwelcoming; when I spoke to the churchwarden and to the Rector I found that they were both the loveliest people, and the churchwarden, who has the key and lives on the road to Foulden, is very happy for people to come and have a look. Perhaps it has just not occured to them to make it easier for people to visit, although there is absolutely no reason why this church should not be open during the day. Most likely, they do not think of this building as a potential act of witness, or as an opportunity for strangers to experience a sense of the numinous, but rather as a rather flash venue for their Sunday Club, subsidised by grant aid from charities and central government. We'd called on the churchwarden earlier, and found her out, but when we arrived at the church the door was open anyway. Two men were refurbishing the organ, and there was also an interment of ashes underway in the graveyard, and for once it made Hilborough seem like a busy place. In fact, this sense of a backwater is something of an illusion, because on a couple of occasions in history this parish has touched the national consciousness. For a couple of centuries, the Rectors here were members of the Nelson family, including the Admiral's father, who left here for Burnham Thorpe shortly before Horatio was born. However, on the occasion of the bicentenary of Trafalgar a couple of years ago, the Norfolk County Council guide almost completely neglected to mention Hilborough, stating simply that Horatio Nelson spent some of his holidays here. Sam Mortlock described the nave of All Saints as a calm interior, and this is exactly right. There are no Victorian dramas - no 19th century glass at all, apart from the unfortunate banding in the east window - and the overwhelming impression is of dust gently settling through creamy light onto old woodwork. The one great excitement is above the south doorway now. This is the early 17th century tympanum which once fitted into the top of the chancel arch, and bears a spectacular royal arms to James I, dated 1611. The rose and the thistle have never looked so verdant, and above them is James I's unforgettable motto, Exurgat Deus Dissipentur Inimici, 'Rise up oh God and Scatter my Enemies', a Latin phrase I often find myself muttering under my breath during a typical working day. At the end of the south aisle is a pretty little lady chapel, which is of particular interest because its furnishings came from the church at West Tofts, restored by Pugin in the 19th century, but marooned for nearly seventy years now within the Battle Training Area, and inaccessible to the public. The statue of the Blessed Virgin and the infant Christ here once graced the lady chapel there. The chancel was used as a mausoleum by the Caldwell family in the 17th and 18th centuries, and their memorials are scattered somewhat bizarrely over the walls, one creating a kind of blank entrance where the sacristy door would once have been. But the piscina and sedilia are the originals from about 1300, with characterful faces at the intersections, including a monk and a knight. Above, chirpy angels look down, holding the instruments of the passion. Wandering back through the cool light towards the blank-faced 14th century font, I looked down at the ledger stones, and saw that they were all for members of the Nelson family. But curiously, the Nelsons were not the only famous military family of the 19th century to touch this place, for resident in the Hall next door in the 1840s was Arthur Richard Wellesley, MP for Norwich, and, more significantly, eldest son of the Duke of Wellington. We may suppose that his father visited him here and attended Divine Service in All Saints. Wellesley the younger had to resign his post and leave Norfolk when his father died in 1856, to become the second Duke. This was the occasion on which he is said to have uttered that immortal line Think what it will be when the Duke of Wellington is announced and only I come in.